It is difficult for us to detect if we have a disease or illness without the help of certain devices and machines. With the use of technology, we are now able to see what is going on with our bodies quicker and with more accuracy than ever before. The healthcare industry is always developing new technology to prevent and find cures for diseases. Interesting enough, looking at the microbiota in a person’s gut is a method for physicians to gather information about an illness. Our gut microbiota contains tens of trillions of microorganisms. There are at least 1,000 different species of known bacteria with more than 3 million genes. One third of our gut microbiota is common to most people. Yet, two thirds are specific to each person, making microbiota similar to an individual identity card. Some other important procedures, such as colonoscopies, upper gastrointestinal (GI) endoscopies and capsule endoscopies require advanced equipment to diagnose a patient. Utilizing gastro technology, doctors can locate specific problems with a patient’s upper gastrointestinal tract all the way down to the small intestine. The National Institute of Health (NIH) helped create the Human Connectome Project (HCP) whose goal is to create a network map of the human brain. Researchers are working to discover how the overall brain works and how everything is connected. Scientists hope to collect data on cerebral disorders such as dyslexia and autism, to try and figure out the causes. Everything in the human body is, in one way or another, connected to the brain and researchers are constantly learning and discovering new information in an effort to improve the way we diagnose. Over the past few years, researchers have conducted studies to find a connection between microbes in the gut and the nervous system. Studies performed by neuroscientist, John Cryan have shown that the bacterial microbiome is connected to various health conditions and beneficial bacteria are able to send signals to the brain. 3.5 million people in the U.S. have Autism which affects a person’s social, communicational and behavioral skills, making it difficult to interact with others. Microbiologist, Sarkis Mazmanian, from California Institute of Technology, found that a specific type of bacteria called Bacteroides fragilis was found in smaller amounts for people with Autism compared to people without Autism. When mice with autism-like symptoms were given Bacteroides fragilis, their behaviors seemed to improve. This study showed that certain gut bacteria are linked to the brain and can affect behavior. Doctors, parents, and researchers have noticed that about three-quarters of people who are diagnosed with Autism have some gastrointestinal issues, which provides additional support to the study’s findings.iv Although there is no cure for autism, with continued microbe research, scientists may find that a cure in the future. Diabetes is caused by high blood glucose levels that occurs from a shortage in the production or response to insulin. Doctors are unsure what the specific cause of this disease is however, it has been connected to genetics, environmental aspects, and obesity. A study by Prof. Elena Barengolts from the Jesse Brown Veterans Affairs Medical Center in Chicago, determined that during the early stage in the development of diabetes, gut microbiota already begin to change. The hypothesis from this study is that the food we eat affects the type of gut bacteria that is produced; therefore, if certain foods are eaten that produce helpful bacteria in the gut then there is a chance for diabetes prevention. From this study, Barengolts concluded that looking at a person’s gut bacteria may enable the prevention of the risk of obtaining diabetes. Since the 1990’s, Olympus America has been researching and developing products for capsule endoscopy procedures using micro-machines and nanotechnology. Olympus’s EndoCapsule device is used as a health data collection and assessment tool to check patients for small bowel disorders consisting of pain, bleeding, cancers, and ulcers. The data is recorded by an antenna belt that is worn around the patient’s abdomen. An antenna is also located in the capsule to allow the device to transmit information. The capsule runs on a battery that can last up to 12 hours in order to collect images of the whole intestine and the capsule has a 160 degree field of view which provides physicians with a larger image. The EndoCapsule takes two images per second as it goes through the esophagus, stomach, small intestine and large intestine. What makes this capsule so innovative is the high resolution imaging, ultra-compact lens, wide field of view, and four white LED lights. High resolution images are important for doctors because they allow for increased accuracy in diagnosis. Olympus also developed the EndoCapsule 10 System software which allows doctors to properly diagnose a patient’s problem. The software analyzes the images taken to look for certain irregular characteristics and uses red color detection to distinguish if there are any abnormalities. One of the many features of this particular system is the 3D display of the capsule track. The EndoCapsule and EndoCapsule 10 software work together to help doctors decide the best treatment options. Proteus Digital Health’s smart pill is designed to keep track of information about a patient. This particular pill holds a one millimeter chip with magnesium and copper instead of a battery. The chip itself is able to generate electricity from stomach acids. The pill is used together with a patch that is placed on the torso. Once the pill reaches the stomach it sends a specific 16 digit code to the patch, which shares information to a smartphone or tablet. Proteus Digital Health recently received $63 million in funding to develop and advance their technology. Proteus believes that these new pills will help patients with physical and neurological problems, by providing blood flow monitoring and vital signs. Early prototypes has proven to be successful, however scientists are still working on more advanced version. The company is also looking to build nanosensors that would be able to live in the bloodstream and communicate to smartphones if there are signs of an infection or other issues. These nanosensors would be acting as an early warning for future diseases and alert people to go to their doctor. These pills pave the way for physicians to easily and efficiently gain information about patients in the future. G-Tech Medical in Palo Alto, CA is constructing a sensor patch for gastrointestinal patients. G-Tech conducted a study on 70 participants with gastrointestinal problems to determine if EKG sensors are capable of identifying gastro issues. Standard wired EKG devices were placed on the stomach of each patient, where data was collected from 18 electrodes. Specific algorithms were then formulated to see what a subject’s rhythmic electrical activity was. The procedure took note of a subject’s gastrointestinal symptoms and their corresponding organ activity and compared the data to a subject with normal stomach behavior. Information collected from the EKG allowed doctors to study and narrow down certain issues in order to find the right treatment for the participant. G-Tech Medical hopes to manufacture and sell their device in the near future. The business refers to the sensor patch as an “EKG for the gut” because it measures electrical movement in the stomach, small intestine, and colon. The sensor patch is still in development, however G-Tech is looking to build a thin, waterproof, and comfortable patch. The patch functions by using Bluetooth LE to transfer information to smart technology, which is then able to send the data to cloud based software which doctors can access. Cloud computing helps store large amounts of data with secure data sharing. Doctors use the electrical signals to analyze and identify functional problems with the patient’s organs. G-Tech is looking towards creating an application for physicians to further analyze the statistics. G-Tech Medical’s sensor patch and software/app tools are unique, non-intrusive technologies that will aid physicians in detecting a patient’s gastrointestinal issues. An upper gastrointestinal (GI) endoscopy is a procedure where a doctor uses an endoscope, which is a long flexible tube with a camera attached at the end, to see a patient’s upper GI tract. Researchers from Ninepoint Medical and Massachusetts General Hospital have developed an endoscope that is different from the traditional endoscopes used today. 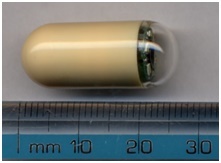 The designed endoscope has a clear capsule, about the size of a pill, attached to the end of a 1mm wide cable. The capsule contains optical frequency domain imaging (OFDI) technology, which is a rotating laser that releases near-infrared light and sensors that record light reflecting back from the intestine. This technology allows doctors to see a 3D image of the GI tract and the entire procedure can be done in around six minutes. Testing is still being done on this product, however researchers are hoping to see it on the market soon. Avantis Medical Systems, located in Sunnyvale, CA, has developed a Third Eye Retroscope (TER), which is a through-the–scope optical technology that assists in detecting polyps in the colon. The TER has a 180 degree vision by looking through a micro-camera located at the end of the device. Cameras are becoming smaller and smaller which allows us to do much more, such as saving lives. Besides having a camera, the TER has an LED that provides light ; and a polarized hood that prevents a glare from the LED. A study of the TER and other similar video colonoscopes on a colon models with hidden tumors determined that TER was the most efficient in finding four more polyps than the other devices. EndoChoice Inc. based in Alpharetta, GA has developed Fuse Full Spectrum Endoscopy, a device is made up of a video colonoscope and a processor that supplies a high resolution, 330 degree field of view, 3.8 mm working channel, air or CO2 insufflation, and water jet irrigation. The full spectrum endoscopy aspect comes from the utilization of three images and LED sets in the front and sides of the equipment. A 2013 study involved physicians first performing a regular forward viewing colonoscope and then a separate colonoscopy using the Fuse model. The forward viewing coloscope found about 11 polyps per doctor and when the Fuse colonoscope was used, there were around 18 polyps located. The Fuse colonoscopy had an 82% rate of finding hidden polyps compared to the much lower rate of 31% when using the regular equipment. Gastroparesis is when food moves very slowly out of the stomach. It is linked to people who have diabetes and other issues such as connective tissue disorders. Medtronic, based in Minneapolis, MN, has developed an Enterra gastric neurostimulation system to solve symptoms linked to this disease. Enterra Therapy is a form of surgery that places a gastric simulation system in the body in order to try to relieve the symptoms of gastroparesis. The simulation system consists of two electrodes that are implanted into the stomach. The electrodes then connect to an external device that delivers signals to the muscles and nerves in the stomach, which then sends electrical pulses to the brain. The messages sent to the brain from the stomach help solve nausea and vomiting symptoms associated with gastroparesis. Microbiological Culturing: biological samples throughout the scope and at the ends are cultured to find any bacterial contamination that may remain on the instrument after the procedure. The scope is quarantined until the results are found. Repeat High-Level Disinfection: disinfection kills microorganisms that on the interior and exterior of the device. This process assists in properly sterilizing the small hidden parts of the gastro instruments which reduces the chance that patients will get infected. By following the FDA’s cleaning procedure, companies can save money by cleaning their devices rather than having to spend more money on a whole new machine. Research and development in new gastro technology will help many people who suffer from symptoms connected to gastro problems. Gastro technology has the power to save many lives by early detection of harmful physical characteristics and associations of mental illnesses. Gastro devices, such as smart pills, sensors, and small endoscopic machines allow physicians to collect data, prevent and treat symptoms. R&D tax credits are available to help support and stimulate gastro technology innovation efforts.